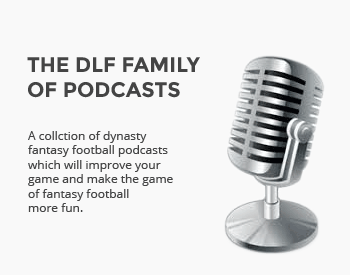 February 2019 – The fantasy football season may be over but your next dynasty season is just beginning! Dedicated dynasty coaches are already shifting gears and looking ahead, preparing for the 2019 NFL Draft. As we have done for the past thirteen years, DLF is here for you, helping you prepare for your dynasty drafts with our dynasty fantasy football rankings. We’ll continue to revise and update these rankings all the way through the draft, and into the NFL season. Be sure to stay tuned for our annual, interactive Rookie Draft Guide coming later this spring! These dynasty ADP results were compiled from regular mock drafts. The MFL Rookie ADP data is gathered nightly from actual real-world rookie dynasty drafts taking place on validated MyFantasyLeague drafts. Additional Rankings from other industry analysts can be found at FantasyPros.com. Be sure to check out 4for4.com for trusted redraft and in-season rankings! You can perform Dynasty Mock Drafts at FantasyPros.com using our own DLF Dynasty ADP data. This is a terrific tool for running quick, easy, solo mock drafts to prepare for your dynasty league start up draft! Be sure to check out our Dynasty ADP Comparison Tool to help compare and assess changing player value over time. Are you looking for a place to host your next dynasty league? We have some suggestions for you to help you find your next dynasty league football experience!